Thomas NEWMAN Sr. (1615 – 1674) was Alex’s 11th Grandfather; one of 4,096 in this generation of the Shaw line. Thomas Newman Sr. was born in 1615 in Brilley, Herefordshire, England, close to the border with Wales. He married Alice MADDOX 12 Nov 1636 in Brilley, Hereford, England. Some source say that Thomas’ wife was Alice Jeremy (Jermy) and that Alice died Hereford, England. Thomas names his wife “Sarah” in his will. Thomas died 31 Mar 1675 in Ipswich, Essex, Mass. Alice Maddox was born in 1624 in Brilley, Hereford, England. Her father was Edward MADOX. Alice died 15 May 1681 in Brilley, Hereford, England. She went back to England after her husband died. 8 Jun 1665 Ipswich, Mass. 31 Mar 1691 Ipswich, Essex, Mass. Passenger list of the “Mary and John” of 1633/34. This list was published in the “Planters of the Commonwealth”, by Charles E. Banks-1930 There has been some confusion between the passengers of the “Mary and John” of 1630 and those who came in 1633 on a ship with the same name. #44. Robert NEWMAN- New Haven, Connecticut. 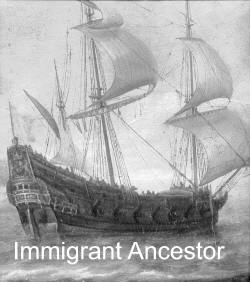 Possibly returned to England by 1660. Reference: NER 9:361: Savage 3:275. #45. Thomas NEWMAN- Ipswich, Massachusetts. Died c.1676. #46. Mrs. NEWMAN Died 1679. #47. John NEWMAN- (s) Died c1674. Reference: Pope Pg 328: Savage 3:276. All sources agree on the following facts…. 1) A Thomas Newman along with an unnamed wife and son John were on the Mary & John arriving in 1634. 2) Thomas & Alice Maddox were married in England in 1636. 4) No family tree includes any info on the son John that arrived with them. 5) Little can be found about the life in America for any of these folks. My guess is that the Thomas Newman who married Alice Maddox 12 Nov 1636 in Brilley, Hereford, England is somebody else and we don’t really know much about his English origins. In the name of God almighty amen: I Thomas Newman being weak in body though in perfect strength of memory, committ my spirit to God that gave it and my body to be definitely buried. Do here bequeath and give to my sonns, Thomas Newman and John Newman all the houses and land they now stand possessing and also do give unto each of them: two cows and three sheep (_____ _____ one with the other with rams) and I do give my sonn Thomas one mare of a Black Brown collour of 7 years old and my mare of a flexen mane and tail of 4 years old to my sonn John and also I give my two _____ to my sonn Thomas. and I do give my dwelling house with all my lands unto my Sonn Benjamin Newman together with all my household shelter and goods, with all therof of my cattle, cows and plows. Wch sonn Benjamin I make my Executor – out of wch estate above given to him in order that my sonn Benjamin shall let my wel beloved wife Sarah Newman, In Joy all the East End of my now dwelling house with such a part of the house as she shall judge necessary for her own use and also let her have and in Joy So much of the household shelter as she shall Judge necessary for her use and let her have two cows, six sheep and maintain the same both winter and sumer and finde her with convenient firewood as much as she shall need all wch I do order and will my sonn Benjamin to form and place together with Eight pouns per year Either in whaet, barly or Indain Corn or to his mothers content all wch shall be during her natural life and further I do order my sonn Benjamin to deliver unto my sonns Thomas Newman and John Newman one acker of Land (in John Mannings) Neck: per person after my well beloved wife is deceased together with that lot at Plum Island bought of Symon Tuttle to be equally divided between them. and also wr as it hath pleased God by his providence to call my sonn Benjamin into his arms, in case he should not return, but God should take him away to himself: Then it is my will that what so ever I have given to my sonn Benjamin, that it shall be Equally divided between my sonn Thomas and my sonn John. They to perform to my wife what so ever I have appointed my sonn Benjamin to do. Proved in Ipswich court 28 of march 1676 by the witnesses. Peter’s wife Alice Meredith was born in 1646 – Hereford, England. Her parents were Richard Meredith and Alice Jones. This entry was posted in 13th Generation, Immigrant - England, Line - Shaw and tagged Ipswich, The Mary and John 1634. Bookmark the permalink. 4 Responses to Thomas Newman Sr. Coat of Arms removed. In reality, Thomas Newman was not part of the gentry and did not have a coat of arms when he came to America.